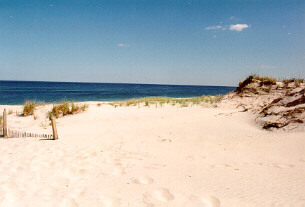 South of Seaside Park, and north of Barnegat Inlet, Island Beach State Park is one of the treasures of the Jersey Shore. Nine miles of natural barrier island, this park encompasses some of the most beautiful scenery in the state. The natural, unspoiled beauty of this park is a vast contrast to much of the over-developed shore. Vast dunes covered with goldenrod, beach plum and black cherry delight the eye. Magnificent beaches offer natural splendor for swimming or surf fishing. Miles of bay-side wetlands are a naturalist's delight. Activities permitted include swimming, fishing, limited boat launching, hiking, horseback riding, nature trails, and canoeing. A daily admission fee is charged, and residents can obtain a seasonal pass for $50. Discounts are available for Senior Citizens and people with disablities.